If you want to hold true to your resolutions long after January has ended, here's how to make it happen. Set goals for your money with Financial Peace University. Why is the gym packed each January but empty again in February? It’s not because people get fit in a month. It’s because they give up on their resolutions pretty quickly. A 2009 study published in the European Journal of Social Psychology found that it takes an average of two to eight months to form a new habit—so it’s no wonder most people’s resolutions don’t last! But here’s the good news: It’s not only possible to stick to the goals you set at the New Year, but it’s easier than you thought. So how is 2017 going to be different? Let’s look at four steps you should take to make your January goals realities this year. In January, you might be tempted to say, “This is the year of the new me. Everything’s a-changin’!” Okay, maybe you won’t go quite that far . . . but you’ll want to tackle way more than is realistic. If you try to do too much, you’ll crash and burn—and nothing will change. It’s just too overwhelming. So aim deep, not wide. In other words, choose fewer areas to improve and really dig into them. A good place to start? Zig Ziglar’s Wheel of Life, an illustration that divides life into seven categories: social, physical, intellectual, financial, family, career and spiritual. Choose the top one or two areas you need to address most. For example, let’s say you know the financial and spiritual areas of your life need major TLC. Go with those. Now that you know you want to improve your finances and spirituality, you need to hone in on what that improvement looks like: You decide you ultimately want to feel peaceful when it comes to your finances and you want to deepen your relationship with Christ. Ta-da! You now have two resolutions. But that’s where most people get stuck. They feel paralyzed because they don’t know where to begin or how to make those big, overwhelming resolutions happen. To make them achievable, you have to specify your desired improvements even further. You have to transform your resolutions into goals. 3. Reframe your resolutions as goals. Resolutions are broad and don’t have defined endpoints. They’re good for understanding the big picture, but they don’t encourage behavior change. Goals, on the other hand, give you a road map to your destination. They allow you to put a plan in place because they’re actionable. Back to our example. Your resolution is to deepen your relationship with Christ, right? So maybe your goal is to pray for two hours each week and read the Bible cover to cover. Your other resolution is to feel at peace when it comes to your money. Maybe your goal is to pay off $12,000 in debt. See the difference? Goals give you the road map to reach those big-picture resolutions. So far, you’ve identified the areas of your life you’d most like to improve, attached big-picture resolutions to those areas, and identified goals to make your resolutions reality. But just like you can feel overwhelmed by a broad resolution, a single goal can also paralyze you if it feels too big to accomplish. Let’s whittle those massive goals down one more time into bite-size pieces. Start with your spiritual goal: to pray for two hours each week and read the Bible from cover to cover. In a year, that’s doable. But you might find yourself trying to cram all your praying and reading into the end of each week—and then it feels more like a chore you’re likely to quit. That’s not doing anything for your relationship with Christ. 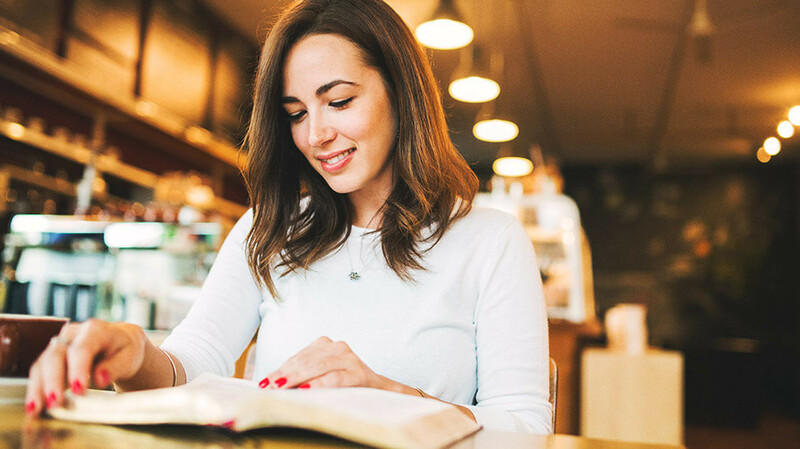 Say this instead: “I’ll pray for 15-20 minutes each morning before I get out of bed and follow a Bible reading plan to set a steady reading pace.” See? That sounds much more achievable! And instead of saying you’ll pay off $12,000 in debt this year to reach your financial goal, maybe you set smaller goals to get you there, like paying off $1,000 monthly instead. If your only concern is reaching that smaller milestone repeatedly, you’ll be more likely to push yourself to make it happen. Plus, each month’s smaller win will build momentum that carries you through to the next one! Now that you know how to set New Year’s resolutions that actually last, what’s stopping you? Make 2017 the year you improve your finances or spirituality . . . or whatever’s ready for a fresh start in your life. You can do it!